Submitted by Mason Hoberg on Sep. 13, 2017. Your playing experience is decided just as much by your accessories as it is by your actual instrument, and there’s no better example of this than drum thrones. If you’re looking for the best drum throne, check out the products below! If after reading through those you’re still not sure which drum throne is right for you, check out the section “Thing to Consider When Buying a Drum Throne” to get more information on what makes a good drum throne. 96 out of 100. Incorporating 450+ ratings and reviews. 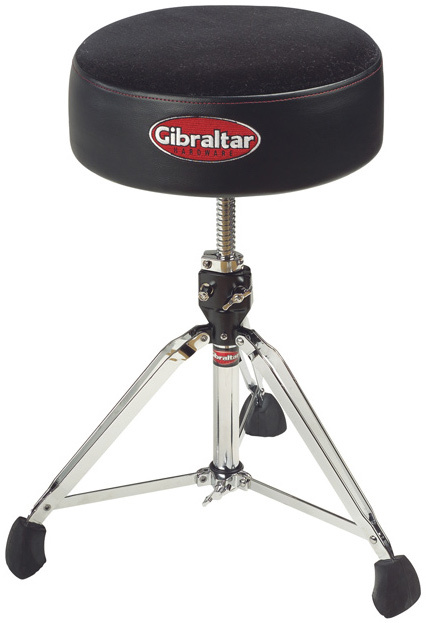 The Gibraltar 9608 features double braced legs, rubber feet, and an adjustment range of 20” to 28”. 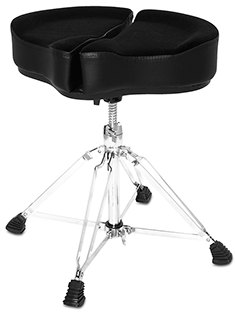 When compared to high-end drum thrones the 9608 is a bit minimalistic, but if you don’t need a backrest or a spot to stow extra sticks that might actually be a good thing. The throne is very portable, yet still sturdy enough for larger framed musicians. The 9608 also comes with a “memory lock”, which allows you to set your preferred height. Then, when you disassemble the throne for transport you can snap it right back to the level it was previously. The threaded construction (which means you have to turn the stand to adjust the height) ensures that once set the throne won’t slip down to a lower height. The Gibraltar 9608SFT is essentially the same throne as the 9608 above, with the only difference being that the seat of the 9608SFT is softer than that of the 9608. It has a bit more give, so some musicians may find that it offers more support. The only thing to worry about here is that if it has too much give for how you’re built it could negatively impact your posture and possibly cut off circulation. Though this is going to vary based on how you set the height of your seat relative to the length of your legs. 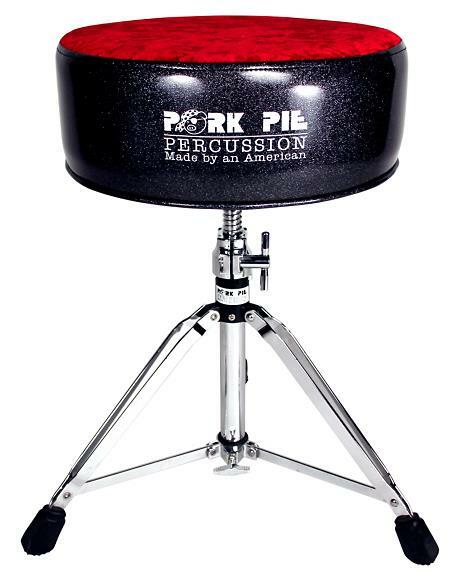 The Pork Pie Round Drum Throne, while at first glance pretty standard, has a pretty unique feature that a lot of other drum thrones lack. Rather than just using foam, the Round Drum Throne uses a combination of therapeutic-grade gel (like what you’d find in a shoe insole) and memory foam. 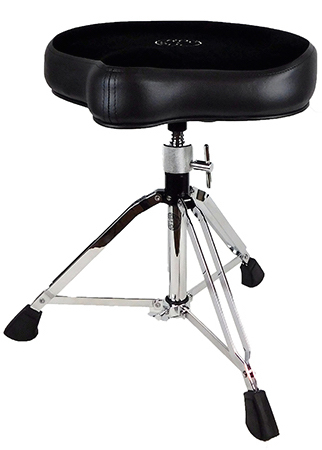 Height Adjustment Range: 21.5" to 28"
This combination is a bit controversial, with musicians either loving or hating it based on how they position themselves on their stool. However, this combination of materials does provide a seat that is both firm and supportive. As far as hardware is concerned, the Pork Pie Round Drum Throne features a level of quality you’d expect from a throne in this price range. The legs are all double braced, and the joints and metal are of a high-enough grade that they’ll hold up to consistent play and practice. The only thing lacking in this throne is a memory lock. Drum Workshop has always been highly regarded in the field, their hardware especially. 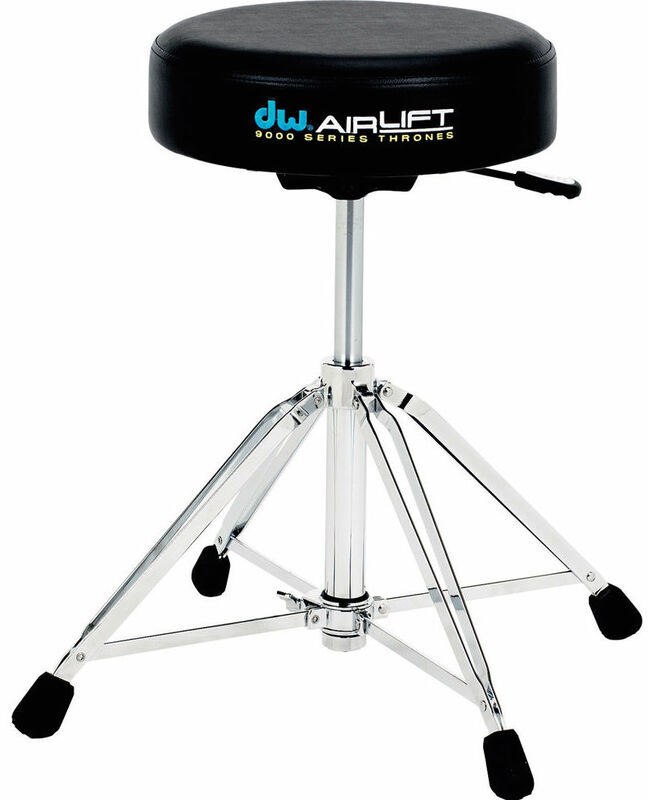 The brand is synonymous with quality, and the DW 9100Al Airlift Drum Throne is a perfect example of this. The throne uses a hydraulic lift system, making raising and lowering it as simple as pressing up or down on a lever. The throne is also very well made, with its double braced legs being one of its stound-out features. While the throne is great for home, the inclusion of the hydraulic lift system may make it a bit too heavy to be practical as a gigging throne. It does fold up into a pretty manageable package, but if you’re going to be gigging consistently you may want to go with something that’s a bit lighter. 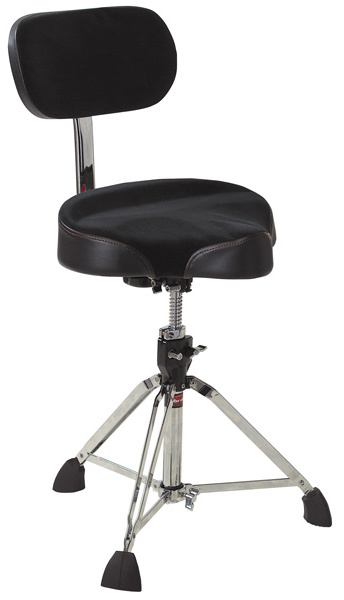 Another member of the Gibraltar 9608 series, the 9608OS is a saddle style drum throne. Basically, this means that the drum throne is modeled off of am old-style motorcycle seat. Beyond that, there aren’t any features that differentiate the 9608OS from other members of the series. As implied by the name, the seat on the 9608OS is oversized. The padding has more give than your standard drum throne, so it may be a good fit for someone looking for a seat with more cushion. The only thing to be wary of is that because you sink into the seat more it may impact your circulation, though this risk is offset by the saddle design. 95 out of 100. Incorporating 90+ ratings and reviews. 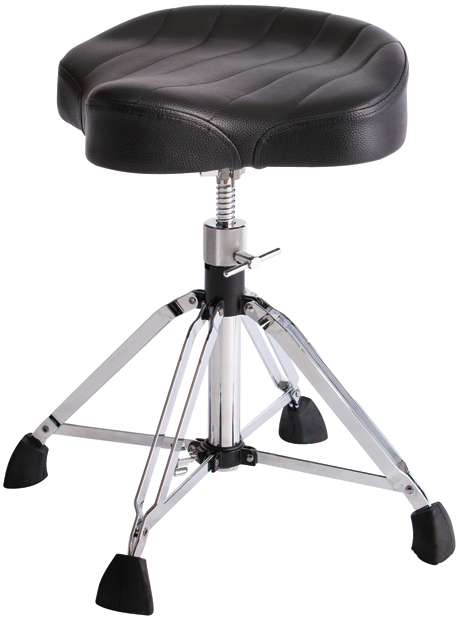 The Roc-N-Soc Manual Spindle Original Saddle Drum Throne offers a great combination of affordability and quality. The throne is very solidly built, and the wide saddle-style seat is great for a variety of different builds and body shapes. The hardware is also of a quality that you would expect from a throne in this price range, so you won’t have to worry about it failing you mid gig. However, the Manual Spindle Original does seem to have a shorter max height than many of the thrones on this list. If you’re of an average height, somewhere around 5’10, or shorter you shouldn’t have any issues. But if you’re on the tall side you’re going to want to go with a different throne. The Roc-N-Soc Nitro uses the same seat found on the Manual Spindle, and as far as the majority of the hardware is concerned it’s essentially the same product. The only difference between the two is that the Nitro uses a nitrogen shock absorber and height adjustment mechanism. The cool thing about the height adjustment mechanism on this throne is that it allows you to adjust your height from a seated position, which is great if you need to make fine adjustments mid gig. Its inclusion does make the Nitro a bit harder to transport than the Manual Spindle, but not to the point where it’s an unviable option as a gigging drum throne. 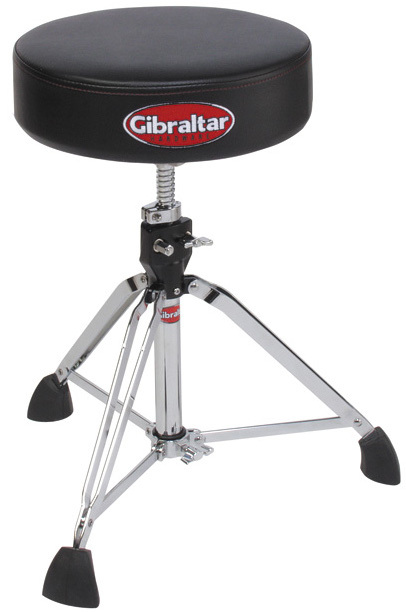 As far as hardware is concerned, the Gibraltar 9908 Drum Throne is very similar to the 9608 series. It has the same layout for the legs, is built with the same materials, and has the same height adjustment mechanism. The main difference between this model and those in the cheaper 9608 series is the seat. The seat on the 9908 was built and designed with a lot of care, and if you have back issues it’s definitely worth a look. In addition to its stitching, it was also built in a way that provides drummers with extra lumbar support. 92 out of 100. Incorporating 40+ ratings and reviews. The Ahead Spinal G is built from the ground up to support your back and pelvis. This isn’t going to have an impact on your playing in the short term, but as you play the ergonomic seat will help to reduce muscle fatigue and possibly even injury. Something that surprises a lot of musicians is that you can actually damage your body playing an instrument. It’s not really a labor intensive activity (when compared to other activities that cause long term damage, like manual labor jobs), but if you don’t use proper technique and have bad posture you can actually cause a repetitive strain injury in your back or arms. You’re still going to need to warm up and stretch, but with this throne you increase your odds of preventing an injury that could either keep you from playing or hold you back from performing at your best. 89 out of 100. Incorporating 225+ ratings and reviews. Another member of the 9608 series, the Gibraltar 9608MB Motorcycle Drum Seat Throne combines the fantastic features found in the series with the extra support of a back rest. If you need the extra support, the 9608MB is actually a pretty good bargain. The throne is actually cheaper than buying a different member of the series and a back rest separately. Beyond that, there isn’t a reason to buy this throne over another member of the series. There aren’t any features that differentiate it from other models in the series beyond the backrest. It still comes with the great hardware the brand is known for, as well as the memory lock mechanism. If you’re not sure which drum throne is going to be the best fit for your needs, check out the sections below! There’s an old saying that you should spend more on the things that separate you from the ground, because in the long run the extra expense will pay off. Now that generally refers to shoes, tires, and mattresses but the same idea holds true for drum thrones. Think about it this way, if you practice/play for an hour a day you’re sitting on your drum throne for 365 hours a year. That’s the equivalent to sitting for 15 days straight. 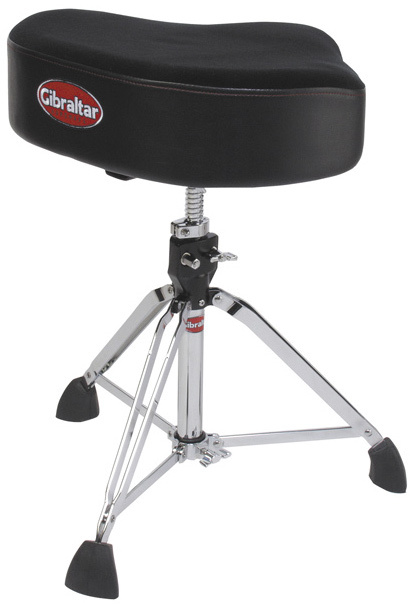 The average person spends a ton on their mattress and their sofa/recliner, so why not invest in your drum throne too? You’re going to be spending a lot of time on it. And that comfort is going to pay off in more ways than one. Something that you realize as you become more advanced as a musician is that a lot of your technique comes down to the subtle movements of your muscles. If you’re playing in an uncomfortable position, or in a way that limits your flexibility, your range of motion is going to suffer. This is going to result in sloppy technique, or even long-term damage if your playing position strains your body. 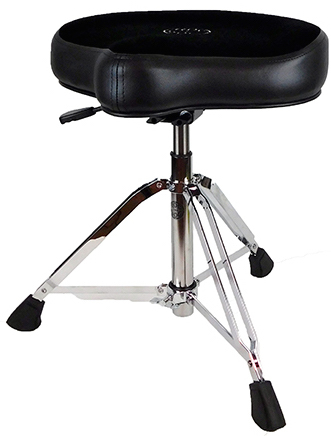 There are two configurations of seat on drum thrones: round and saddle. Round seats are cylindrical, while saddle seats are shaped more like a motorcycle seat. Drummers generally have a strong preference for one type or the other, depending on how they’re built and how they sit. The only thing that you really need to keep in mind is that depending on how you sit one type of seat may cut off circulation to your legs during extended playing sessions. In this case, it’s best to spend some time on both types of seat to figure out which is going to be most comfortable for you. Drum thrones are pretty simple pieces of equipment, but if you plan on gigging you’re going to want one that is built with quality hardware. Low quality metal can strip or bend, resulting in a seat that is unstable and unreliable. The quality of the bracing is also important. Bracing reduces the force exerted on an area, but too much bracing makes a stool unwieldly. This is why a lot of the nicer stools use double bracing. Double bracing uses two thin braces to create a compromise between strength and portability. The material your seat is made of also has an impact, though it’s a subjective issue. A good analogy would be the type of pillow you use. I like firm pillows, some people like soft pillows, some people sleep without pillows entirely. It’s a combination of your preference, the condition of your back, and the techniques you utilize. There are two main methods of height adjustment on drum thrones, friction knobs and hydraulic. Friction knobs are hand turned screws which use friction to hold your seat at the desired height. The cool thing about friction knobs is that it’s really easy to make fine adjustments. And if you mark you’re preferred height it’s a snap to bring your throne to the desired height consistently. The flaw of this design is that it can wear out, and it’s a bit more labor intensive to make adjustments than it is with the gas pedal design. Hydraulic adjusters are another method of height adjustment. In addition to drum thrones, they’re also commonly found on office chairs. They have a flat tab, and you push them down to raise the seat and lift them up to lower it. This method of height adjustment is easier than friction knobs, though it can be harder to set it to a consistent level when tearing down and setting up. The standard male height is 5’10, so if you’re roughly that height the majority of seats are going to suite you just fine. If you’re significantly taller than this, there are specialty stools available (though they may require some independent research). Users as tall as 6’3 report being able to use seats with an adjustment range of 20” to 28” comfortably, so a maximum range of 28” will be sufficient for most individuals. Portability is one of the main features you should look for in a drum throne, and the reason it’s coming last in this article is that you have to compromise between portability and the features above. The more portable a stool becomes the more it sacrifices comfort and stability, with the inverse being true as the stool becomes less portable. Deciding what balance of features you need is a decision that starts with portability, but you need a knowledge of the other factors at play before you can make an informed decision. We looked at all the drum thrones available from major online American music gear stores and short-listed 22 of the most promising ones for further analysis - you can see them all in the Music Gear Database. We then collected more than 2,500 ratings, reviews and feedback from retailers, forums, blogs and videos and processed those data with the Gearank Algorithm to produce the scores out of 100 that allowed us to select the highest rated options to recommend in each category above. For more information about this process read How Gearank Works.